Plane tap water can be full of contaminants, so washing with soap and water on board doesn't guarantee germ-free hands. Travel with a small hand sanitizer and sanitize your hands after using the restroom and as soon as you leave the transportation vehicle. Avoid touching your mouth, eyes, or nose until you have left the plane or train and washed your hands properly. A small pack of antibacterial wipes can also help minimize your exposure to germs on public transportation. Wipe down trays, arm rests, and other parts of the seat area you will touch during a flight or train ride. Use a tissue or wipe to open doors or hang on to poles instead of using your bare hands. In a rental car, wipe down handles, steering wheels, and seats weekly. If you can choose your seat on a plane or train, find one that is away from other people, if possible. This can mean sitting in unoccupied back rows or picking a plane seat where someone does not occupy the middle section. You'll avoid germs and small talk, all at once. Score! In a car or on a train, open up a window to get fresh air, if possible. Closed cabin air spreads germs throughout the area, so even if you're just taking a road-trip with your family, be sure to crack the windows often. 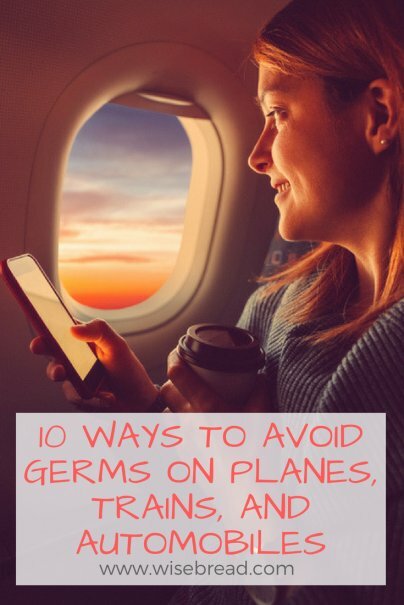 One of the reasons flight passengers get sick is because of the low air humidity, which dries out nasal passages and makes our bodies less effective in germ prevention. Travel with nasal spray to help prevent this problem. Devices like a UV Water Purifier use UV light to kill bacteria and viruses in water. So even if you don't have already filtered water, or even tap water, you can use a tool like this to gather water from practically any source and stay hydrated without worrying about the water quality.